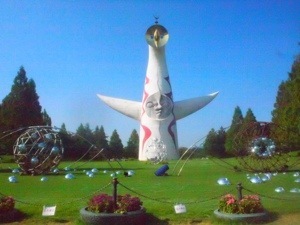 Loft Umeda held an exhibition for artists celebrating the Expo Parks Tower of the Sun, hes a really creepy character but after going to the Expo 70 exhibition in the park Ive got a soft spot for him now. 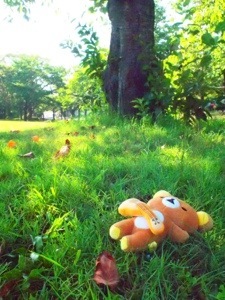 We wanted to go to Lake Biwa on Mon but woke up too late, we umhed and hawed about what to do for ages. 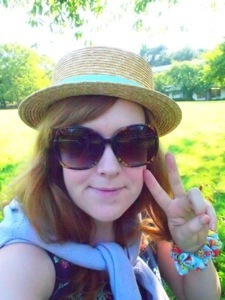 Then we decided to picnic in Expo 70 Park. Even though it was 38 degrees (and feels like 42!). It took us two trains and a monorail to get there. 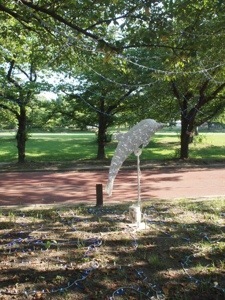 It only cost ¥250 to enter. 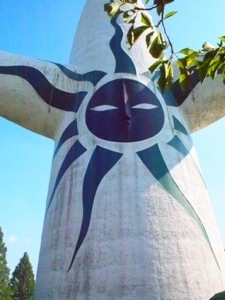 The famous Tower of the Sun. 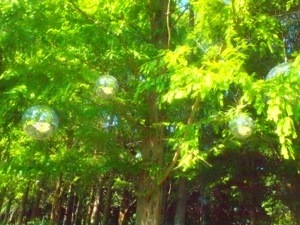 The trees have disco balls! 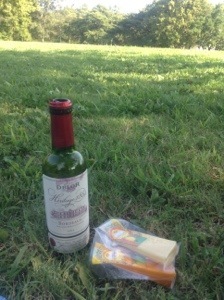 We had a lovely picnic of red wine and cheese, which we got for our birthdays from our UK friends! Guitar rilak came to relax. It was so hot I’m glad we found space in the shade. My mum skyped as we were picnicking it was great to chat and see my nephew hugging my dog – cuuute! We walked to the boating lake and the lights all came on, they are having an evening light up at the moment but they got turned on so early, about 4.20pm! We walked to the lotus garden as lotus plants are in season right now and we missed them last summer, but a big gate blocked our way. 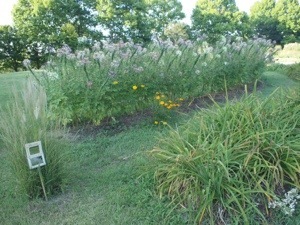 We asked a worker and she said it was not open, so we asked about the Japanese garden it was closed too. Looking at one of the parks sign maps those areas were shown in grey, as if they are closed for good. 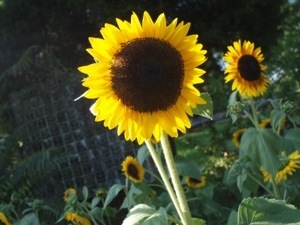 And then towards the sunflowers. About 5pm they started closing off areas for the evening light up, we sat near the entrance cafe and had a drink and watched the Tower of the Sun. I had a nice time at Expo Park, we couldn’t use the pedalos which was our own fault but was pretty disappointed not to see the Japanese garden or any epic flowers. It’s sad to see half the park closed, I hope they reopen it again someday soon.